This play works well if you have an outstanding point guard and the defense is in man-to-man. Setup: O1 is at the point. Set the stack down low, with your best three point shooters at the O2 and O3 spots, and your best post players at the O4 and O5 positions. Your outstanding point guard (O1), will try to drive on his/her defender. O1 may create his/her own shot, or as the defense collapses, dishes off to an open teammate. This could be an open post player, or an open corner 3-point shot. O2 flares to the three-point line after the screen. O3 moves out to the top and is the prevent man on defense. 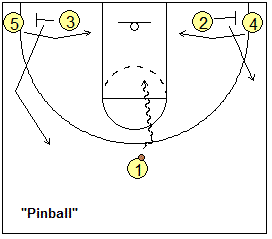 This play could get you a corner 3-point shot, or a hi-lo feed into the low post. Start with the 1-4 low stack as seen in the diagrams below. O2 and O3 will both run the baseline and cross to the opposite corner-wing. O1 looks to pass to either O2 or O3, for the 3-point shot. If the pass to the corner is not made, O1 then dribbles off to the right side, as O5 flashes up to the free-throw line. O5 receives the pass, and O4 cuts into the paint for a post-up and the hi-lo pass from O5. If the pass to O5 is denied, O1 might be able to make the pass directly to O4. Of course, if O5 is a stronger post player than O4, you could switch the roles of O4 and O5. This play gets the ball to your talented O4 at the high post, and there are several options, with O1 and O2 making "scissors" cuts off O4. Again, start with the 1-4 low stack as seen in the diagrams below. O4 flashes up to the high post and gets the pass from O1. O2 moves down to the block, and then makes the first cut around O4 for a possible hand-off and jump-shot. Next, O1 cuts around O4 for a possible hand-off and a take to the hoop. If O1 does not get the ball, he/she moves out to the ball-side corner. If a hand-off is not made, O4 has the option of shooting, or making a dribble move to the hoop. If O4 is one of your best athletes, these may be the best options. In this case, we have used the scissors cuts mainly as a decoy, and to cause big-little mis-matches if the defense switches. Other options are the hi-lo pass to O5, or a pass to either corner. Here's a play (below) that I saw the San Antonio Spurs run in the NBA playoffs. This play was designed to get the ball into the big guy (Tim Duncan) on the low post. Start with a low stack with the post players inside (see Diagram A). O2 will split out to the three-point arc and receive the pass from O1. Meanwhile, O4 sets a screen for O5. O5 cuts around the screen to the ball-side low post looking for the pass from O2, and the shot. The Michigan play could be adapted to the 1-4 low stack set, by flashing both low posts to the elbows.